I am physists working in the field of high energy physics. After finishing my PhD thesis at the University of Hamburg, I moved to Barcelona where I am working as a postdoc on TPC R&D. In this scope I am involved in the long baseline neutrino experiment T2K, the double beta decay experiment NEXT and in a R&D program to develop a TPC with a pixel readout. An overview about my current research projects can be found under the menu point "Research" and also under "CV". A collection from my photos taken during my private and offical travels can be found under "Photos". 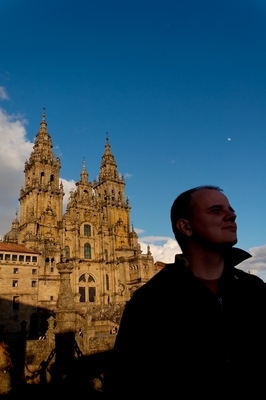 The picture on the right shows the cathedral of Santiago de Compostela which is my favourite city in the world. As all other pictures on this web page it underlies my copyright and must not be used in other web pages without my permission.